I wrote a post for GeekMom over the weekend about the launch of Phillip Lim’s collaboration with Target. Then bright and early Sunday morning, H and I ventured out to Target for the 8am opening. There were about a dozen people in line for the opening, and by the time I got H into a cart and over to the clothes women (and a few men) were just picking the racks clean of everything. But, we did manage to get some great goodies into our cart. We also scoped out the dressing rooms as people tried things on and returned them. The handbags were the worst, and everything I’d read beforehand correctly predicted that they would be the first thing to go. They weren’t even out on display, but five minutes after opening some employees wheeled out a palette of boxes. A few female customers tore them open (while others just looked on, confused) and grabbed bags from inside. I fully admit that when I realized what was happening I jumped into the boxes and grabbed 2 of the very last bags before the onlookers came to their senses. And one of them was the main thing I had wanted from the entire collection. So I was pretty happy. 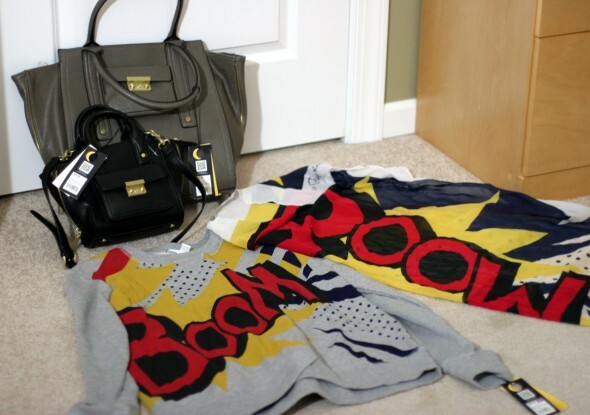 So I was able to get the BOOM sweatshirt and the BOOM scarf (last one), both of which are adorable. I was really surprised that no one was going after the sweatshirts; there was a mom there picking out things for her college-age daughters, and I pointed her to the rack of sweatshirts. I mean, Lim’s Ka-Pow top is so well known I thought this would be the item I’d be fighting for. And it was one of the main things on my list, I picked it up with no problems. I also got the Mini Satchel in black and the Tote in taupe–the bag I really, truly wanted. There is a fabulous purple version online, but I am surprised by how much I love the taupe. 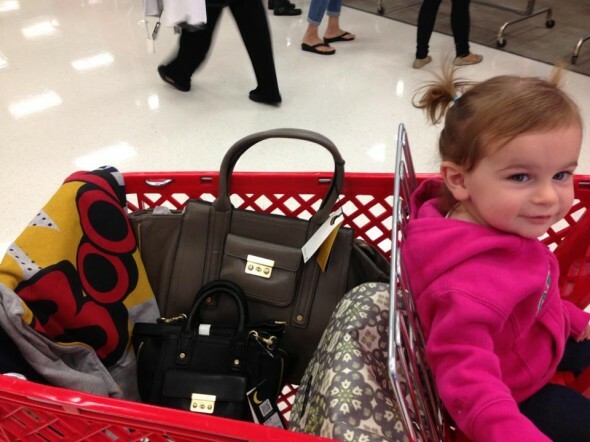 I don’t rock a lot of neutral bags, but I’m into this one. And it’s big enough to throw a few baby supplies in if necessary. H is moving away from the days of needing 5 changes of clothes and endless diapers every time we go anywhere, so it’s nice to think about carrying real bags again after a year and a half. The opening was a lot of fun.